This is a fully equipped folding mountain bike that allows adventures on steep climbs and equally difficult descents. After single track riding, you can easily fold up the bike and stow it into any kind of luggage compartment and then be on your way to your next cycling adventure. Suntour XCR Taiwan made fork, Shimano 27 Speeds, 13kg. Fully Diamond Frame design, standard MTB frame geometry. Ensures proper alignment. when the bike is unfolded. Passed mountain frame test, ISO 4210 certified. Strongest, Smallest, Lightest, 100% Part Compatibility, Tooless. The ONLY Folding Bike Frame that has passed the ISO 4210 MTB test. It is good quality Taiwan Made hydraulic suspension fork with speed-lock cartridge.The model is 32mm stanchion tube which is stronger and more durable. Shimano FC-MT300 crank set 44/32/22T with Deore derailleur is High performance: Advanced technology for easy • Control • Tough: Proven technology delivers durability and reliability. Change lightweight folding bike is specifically made for long distance travel, including by air travel, in an RV, yacht as well as any other form of transportation that involves stowing a bike into any kind of luggage compartment, in addition to also being conveniently transportable for any short distance commuting. The advantage of a 27.5” wheel/700C touring bike is it is easy to repair and find replacement parts no matter where you are in the world. 27.5 inch full size bike is low center of gravity, allowing greater stability. 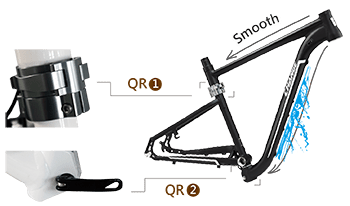 It is the ONLY folding frame design to achieve strictly MTB frame safety test, ISO 4210 certification. 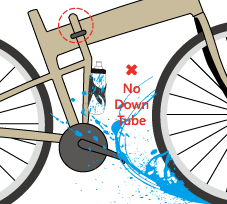 Front triangle frame enables folded ( close to a 27.5-inch) that can be easily placed in the trunk and the front wheel can be fixed on special natch to prevent scratching the bike body.